I was lucky enough to be given a Chocolate Tour of Mayfair by a client and I took two of my favourite people with me; my boyfriend Manuel, and best friend Sophie (same lovelies with whom I had the “Cheesiest Time in Reggio Emilia“). A free chocolate tour was exciting enough but when we heard that our meeting point was to be Sketch, Sophie and I nearly wet our knickers! What a fantastic, luxury treat to spend a hour tucked away in the plush, exuberant womb that is the Sketch’s Palour. We enjoyed the best-hot-chocolate-I’ve-ever-had, and a delicious warm apple puff, whilst we listened to the history of chocolate and learned some interesting facts about the development of the three types; dark, milk and white chocolate. The cosy corner, heady hot chocolate and artistic decor of glowing neon signs made the start of this Saturday morning tour quite surreal and it was with blinking eyes and a sense of new adventure that we appeared into the sunny street, ready to head to our first chocolate shop. Now if you’re a chocolate fan you have probably heard of Charbonnel et Walker and if not you might recognise their stylish and iconic packaging. Interestingly enough the founders of this well known and delicious brand, were themselves the perfect combination; Mme Charbonnel, a fantastic chocolatier (and rumoured mistress to the King) and Mrs Walker, who made pretty boxes… and was possibly also in the King’s list of “friends”. 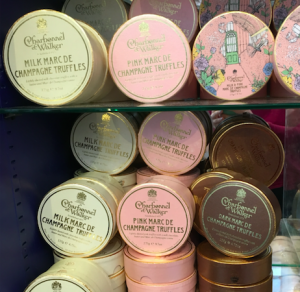 The brand holds a Royal Warrant and we were given the chance to sample a violet cream and a rose cream chocolate – said to be favourites of the current day monarch, Queen Elizabeth II. I could spend all day writing about the history of this gorgeous brand but I just found an excellent article that does the job for me – and who am I to clog up the internetesphere with duplicate copy! Next up was a very funky chocolate shop that I hadn’t previously heard of, called Prestat. 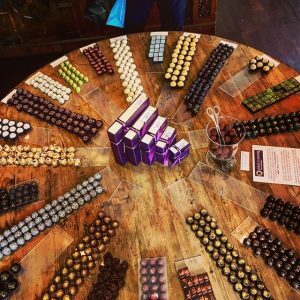 Their website doesn’t really do them justice; in contrast, the shop we visited was a burst of colour tastefully tucked away in Princes Arcade, and the display counter was full of enticing and unusual chocolates. There was definitely an influence of the quintessentially English; Earl Grey Tea and London Gin truffles (two flavours, not a weird mix! ), The Union Jack box – the result of a gourmet truffle originally created to celebrate Will and Cate’s royal wedding – and another appearance for the English’s favourite, rose and violet creams. There was a touch of the Willy Wonker in this shop with it’s bright inviting colours, swirly gold details and creative flavours. I bought some gin truffles for a booze loving friend’s 30th birthday gift and we were on our way. This next place was an absolute dream – and provided a savoury relief after a slight overdose of chocolate tasting. 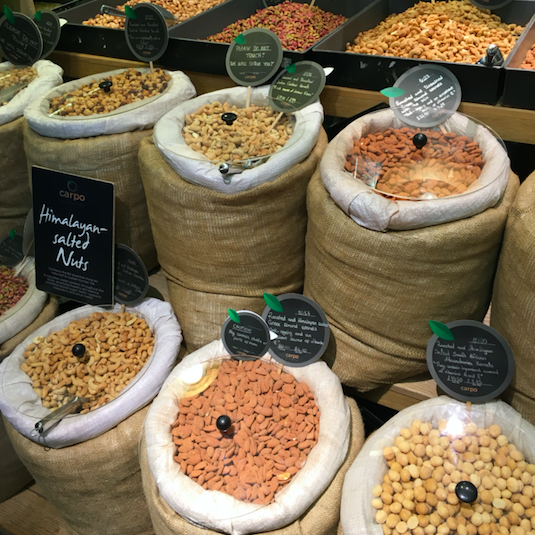 Carpo is a Greek shop that sells sensational chocolate but also provides a range of nuts, coffee beans and other delicious products like their traditional Greek honey and bags of granola. After a morning of lots of pink (Sketch, C&W and Prestat had pink in abundance) this place felt deliciously rustic and appeased the raging hipster in me with it’s open sacks of nuts and spices, clear wall mounted tubes of coffee beans, and delicate parcel-string tied truffle bags. Again I dived into my purse to buy treats – this time a gift to the friends that were putting Manuel and I up during our stay. Why I didn’t grab somethings for myself I do not know! I will definitely be back and think this might just be the starting point for my Christmas shopping. Last but by certainly no means least was Paul A Young’s. This guy is really making some noise in the chocolate scene at the moment and with the role of head pastry chef for Marco Pierre White under his belt, you can expect to be impressed. All in all this chocolate tour was a great success. The group was small enough (about 8 people) that we could all hear the guide, ask questions and get chatting to each other. We sampled delicious chocolates in every venue and learnt lots of interesting things about the history of chocolate and some of the areas of Mayfair that we were walking through. It was great to be a tourist in my old home town (city!) and to spend time with Sophie and Manuel doing something fun and a little bit different. If you’re interested in this tour here is the tour website and for more of my food adventures follow The Tale Of A Teaspoon on Instagram.